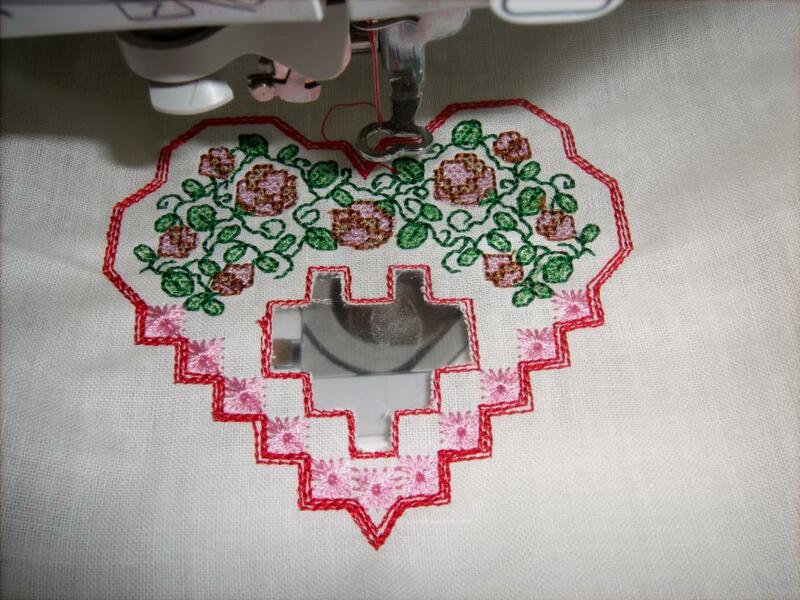 Hardanger is a type of stitching that uses the canvas itself as part of the design. The open weave and intricate use of the cloth is what makes Hardanger so fascinating. It is considered to be a Norwegian style of needlework, I think an artisan can create and recreate to infinity. For doing Hardanger, select an even weave fabric with visible/counted threads style of fabric. Even with the machine work, this is a preferred type of material. For hand embroidery, you can, carefully, count the threads and with Hardanger, the usual procedure is to use 2 lines of thread and count as a single strand. Using each strand would be more delicate but much more difficult to work with. 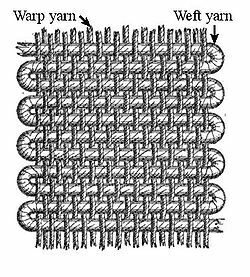 A typical 'bottom weight' or light canvas or even an Aida fabric would be around 22 lines of thread per one inch. By hand, this procedure is really eye straining. I personally would use a strong magnifying glass but by machine, it is really rather simple. The first trick would be to get the fabric as straight as possible in the hoop. There is a 'tip' in Layout Blog that I consider to be very simple and clever. The second issue that I want to point out is that Hardanger tends to be dense and open, alternately. That presents a stabilizing issue. I personally would be using a heavier, and likely a heavy wash away for this type of work. I feel that most of Ann's stabilizers are excellent and especially Badgemaster. If there is a small amount of the stabilizer left in the strands of the fabric, so much the better for keeping your work as beautiful as the day it was done. Norway has been a leader in the use of Hardanger; frequently it can be seen in the beautiful Norwegian long aprons called bunads. This type of work is frequently seen, worldwide, in home linens as well. Hardanger is also considered to be ‘white work' which essentially means that it is accomplished ‘white on white' making it very subtly elegant. The sculptural nature makes it wonderful for pattern creation. Newer work is often in contrasting threads to show off the details. 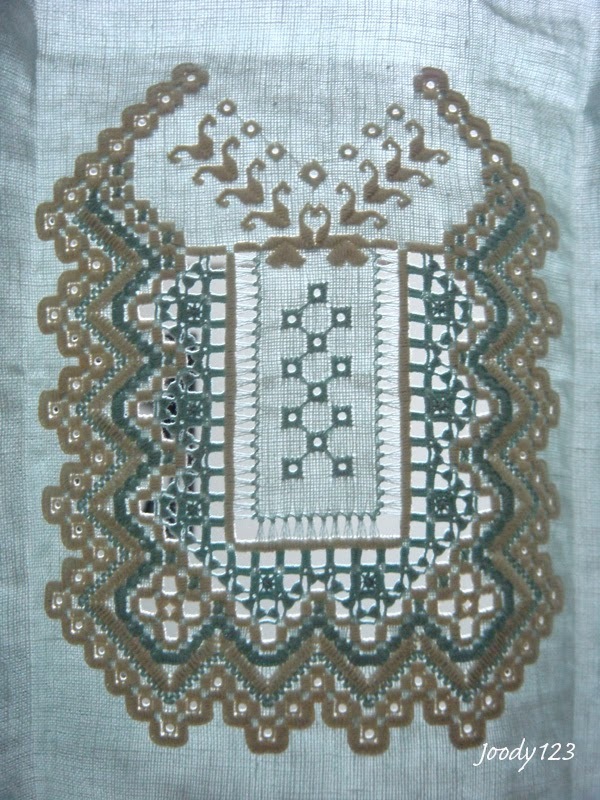 Hardanger embroidery uses Satin stitch blocks known as Kloster blocks, consisting of 5 parallel satin stitches, worked over a group of 4 x 4 ground threads. 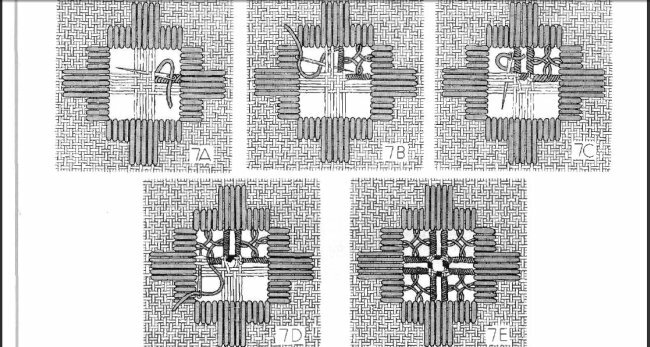 These blocks enclose areas of fabric where a number of warp and weft threads are cut and withdrawn, leaving a network of loose threads and large holes within the shape defined by the Kloster blocks. 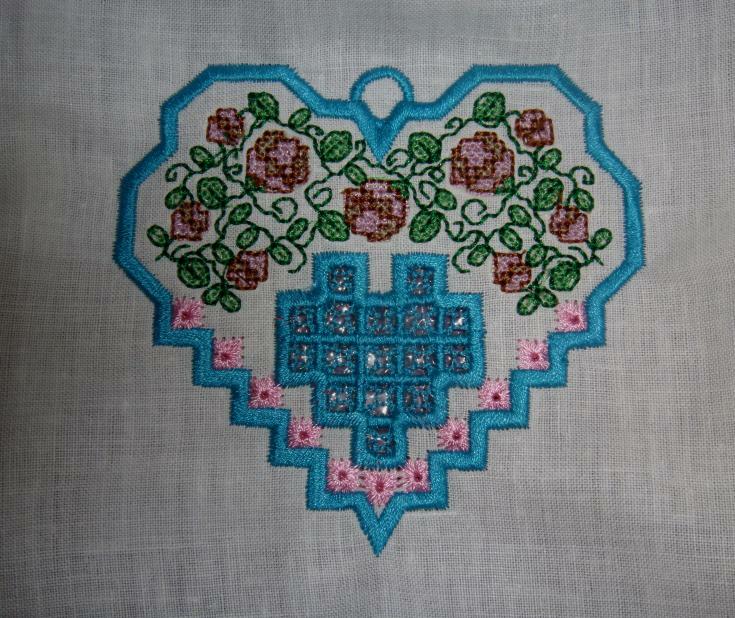 Various decorative filling stitches are then worked over the remaining loose threads and holes to create a lacy effect. Just viewing the examples shows me how intricate the work my grandmother did actually was. She did teach me to hand embroider. She would be shocked to see how we embroider today. Digitizers are always trying to replicate special effects created by our early sisters in embroidery. This design is no exception. When I found the Hardanger motif, I thought of all the places I could use it. Those places included a tote bag pocket, linen selections and a pinafore for my granddaughter among other things. I did this project as a guest towel as available from All About Blanks. If you are not familiar with All About Blanks, they have the finest items of linen available on the net. These guest towels are only $45 for a dozen. At less than $4 per towel, I keep them around for a quick, easy and memorable last minute gift. While I did not achieve an exact replica of Hardanger, I feel it is a great representation of the amazing world of embroidery of years gone by. Additionally, the digitizer for this pattern did replicate the inside twist called "dove eyes" as shown in the last diagram above. The cross stitching of the design will now allow for definition of the flowers, and the digitizer does call for this to be done in floral colors. 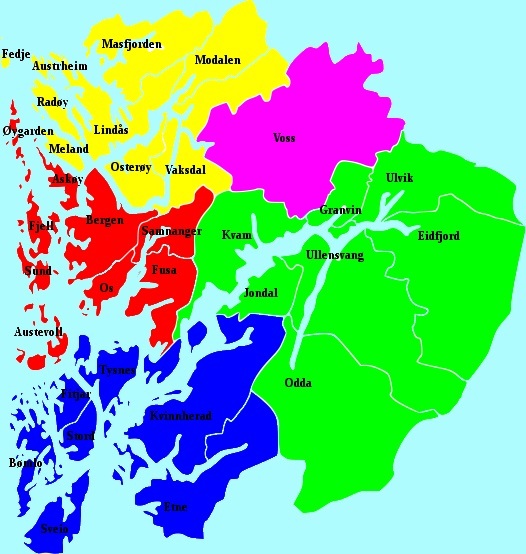 So, this is not following the Hardanger rules - but then again, who follows rules. . . .Additionally, this particular design can be done as a hanging ornament, and not just for Christmas. 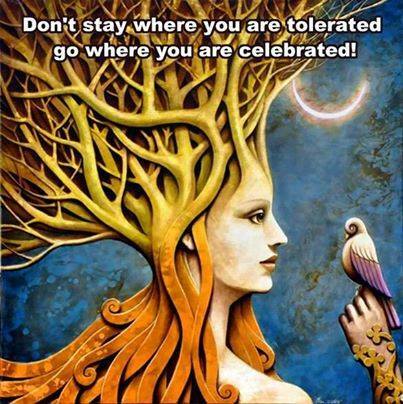 Imagine it as part of a wall decoration or placed in a foliage plant. What a find this one is! The design is courtesy of Laura's Sewing Studio. Photo courtesy of Laura's Sewing Studio. 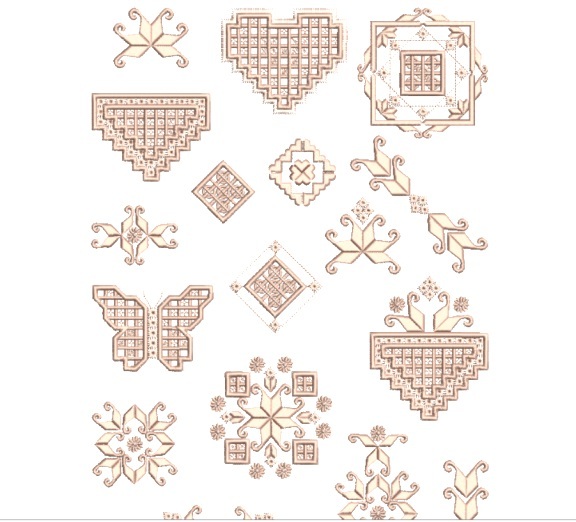 There is an element of ‘cutwork' in Hardanger. As you are sewing, you will see the outline that will need to be removed. See my blog posting on "Cutwork" for further instructions. Don't forget that when you remove the fabric for the cutwork, leave your water soluble stabilizer (wss) in place. The remainder of the design will be placed there. After I completed the design, for better visibility, I kept the wss in place. Naturally, I will remove it before giving it as a gift. Here is my interpretation of that design, and I am delighted with the results. Using quality fabric and design always pays off! Try it, you will love the heirloom quality of it. If you have 6 minutes, you will want to see this: https://www.youtube.com/watch?v=PTRICyLpV94 You will be awed, I guarantee it.